City in the province of Moravia, Austria. It had a Jewish congregation in the Middle Ages, which was expelled Aug. 30, 1563. The cemetery was deeded by the Jews to the city under the condition that it should be preserved. It has, however, entirely disappeared. The new settlement did not begin until after 1848, when the law permitted Jews to settle in all parts of the empire. In 1893 there was organized a congregation, which now comprises the Jews living in the districts of Neutitschein, Fulnek, Frankstadt, and Freiberg, and which numbers about 600 persons. 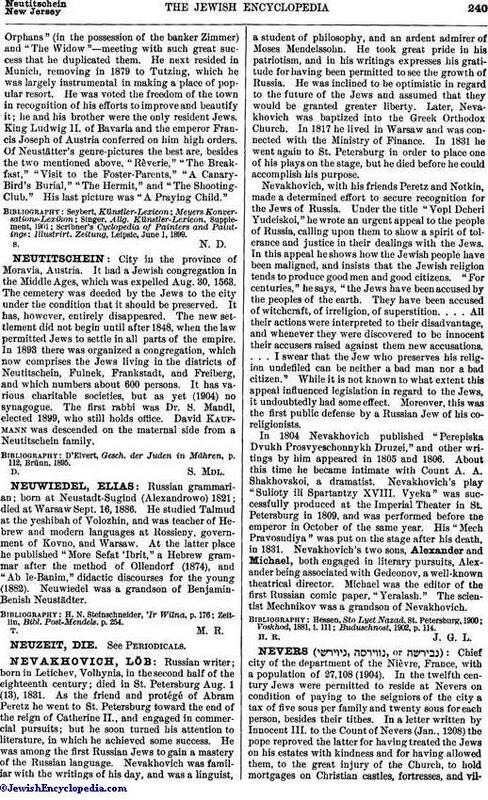 It has various charitable societies, but as yet (1904) no synagogue. The first rabbi was Dr. S. Mandl, elected 1899, who still holds office. David Kaufmann was descended on the maternal side from a Neutitschein family. D'Elvert, Gesch. der Juden in Māhren, p. 112, Brünn, 1895.